ALBUQUERQUE, NEW MEXICO (ANS)—If Protestants had a top-ten list of heroes, William Tyndale (1494-1536) would surely be on the list. 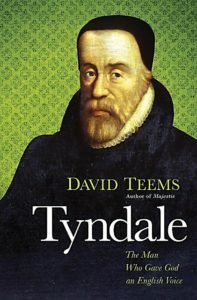 David Teems’ book, Tyndale: The Man Who Gave God an English Voice, tells us why. In eighteen well-researched chapters, Teems offers a penetrating look at the 16th century scholar and translator who became a voice of reformation in England. Tyndale was born in Gloucestershire, near the border of Wales. He attended Oxford University, taking a master’s degree in theology in 1515. 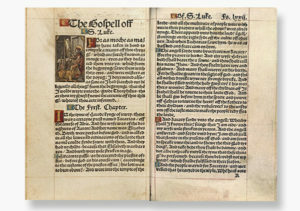 Tyndale’s ambition, however, was to translate the Bible into English. Leaving England in 1523 to do so, he arrived in Germany in 1524. After going back and forth between a few German cities, Tyndale began the arduous task of translating the Bible into English in Worms, Germany. Initially influenced by Desiderius Erasmus— the Dutch scholar and translator of the Greek New Testament, Tyndale translates much of the Bible into English by 1526. 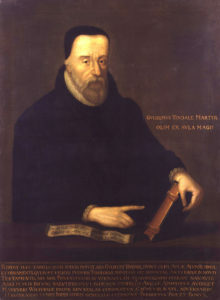 Tyndale completes a revised publication in 1534. These actions, of course, were frowned upon by the Roman Catholic Church; in turn, pitting him against authorities. Add on top of this Tyndale’s opposition of Henry VIII’s divorce, and you’ll understand why Tyndale became a marked man. In 1535, Tyndale was betrayed by friend, Henry Philips, arrested and jailed in a castle in Brussels. And despite British politician Thomas Cromwell’s pleas for his life, Tyndale was tried and charged of heresy, strangled and burned to death in 1536. It was reported that Tyndale cried out, “Lord, open the King of England’s eyes” during his hanging. Around the same time, Myles Coverdale—using much of Tyndale’s work, published the entire Bible in English. All of this intrigue—and more—is recounted in Teems’ marvelous biography. And what’s interesting is that the book recently placed the number one spot on Amazon more than 7-years after its initial publication in 2012. What brought upon the interest of people in Tyndale, I don’t know. But what is known is that Teems’ biography is full of fascinating facts as forlorn feats of England’s often misunderstood son. It’s all found in Teems’ biography. But the book is more than a re-telling of Tyndale’s life. Beyond the biographical chapters lies three marvelous appendix’s that outline Tyndale’s influence. I was particularly struck with Appendix B which provides a list of words introduced by William Tyndale. Some of the words include “anathema,” “God-speed,” “castaway,” “taskmaster,” and “under-gird;” words used today, reminding me that Tyndale’s genius is still felt in the English-speaking world. Add to his influence with words, is his deep influence on the English Bible. According to Random House Webster’s Dictionary, the King James New Testament is 83.7 % Tyndale’s and the Old Testament is 75.7 %. The bottom line: Tyndale’s influence is profound. Furthermore, in Appendix C, Teems provides two letters of Tyndale written to John Frith. These letters show Tyndale’s deep devotion to God and Tyndale’s distress over non-Biblical doctrines taught by many within the Church. Not only does it give a very human face to Tyndale but affords the reader an opportunity to place Tyndale in history. 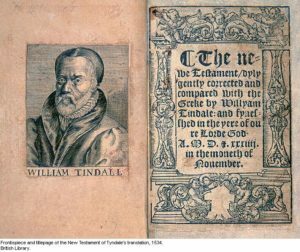 Collectively, Tyndale: The Man Who Gave God an English Voice is a marvelous achievement. And to this end, Teems has done readers a great service—writing a book about a man serious about The Book. Teems is a best-selling author and musician who grew up in Atlanta, Georgia. He where he studied Psychology at Georgia State University and cultivated a lifelong passion for the English voice—Shakespeare, Tyndale, Wordsworth, and others. 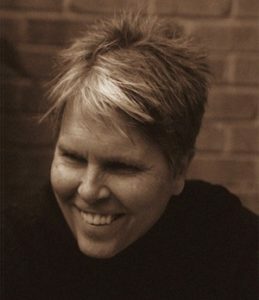 The author of six published books, Teems’ other titles include Godspeed: Voices of the Reformation, and Majestie: The King Behind the King James Bible. Teems lives with his wife, Benita, in Franklin, Tennessee, close to their two grown sons and their families. For more information on David Teems, visit DavidTeems.com, and follow him on Facebook (facebook.com/davidteems) and Twitter (@davidteems).